There is a bit of a trend among gym rats of people who neglect their lower body in strength training. While both men and women do this, it is more visible with men because they grow muscle more easily. While the memes are extreme examples, I think there are a lot of people who will do cardio along with upper body strength exercises. Along with lower body, the back is also neglected often. Strength training is very important for injury prevention. The knees and back are common areas to wear down later in life, so strengthening them would be a good idea. The legs are the largest muscles and the ones we use the most often. In addition to injury prevention, training your whole body is also important for balance, agility and not having the build of a chicken. 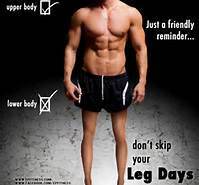 Cardio is not enough for the lower body because it primarily uses a different type of muscle (Type I/ aerobic) than resistance training (Type II/ anaerobic). Go for a weight you can just barely do 1 or 2 sets of 10 reps.
Make sure you wait 2-3 days before working the same muscle groups (so they can rebuild).